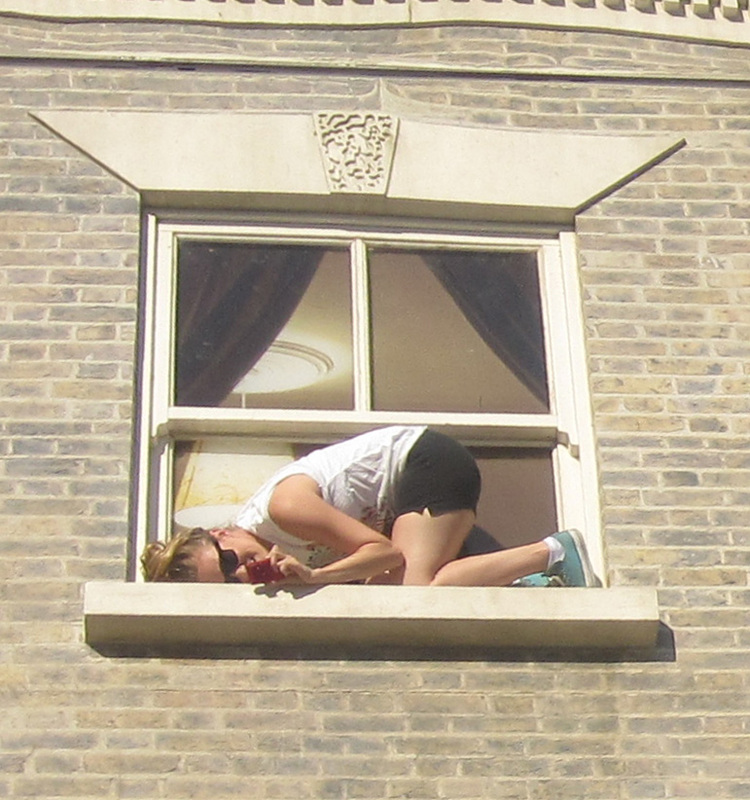 Today I went to the much talked and tweeted about Dalston House by Leandro Erlich and hosted by the Barbican. It’s free, it’s about to be everyone’s summer facebook cover photo, and it is a piece which could inspire the most cynical of Londoners to crack a smile. It is so much fun. No, really, it is. Out of all the exhibitions and shows I’ve been to in the past few years, this takes the cake for pure, un-adulterated joy. 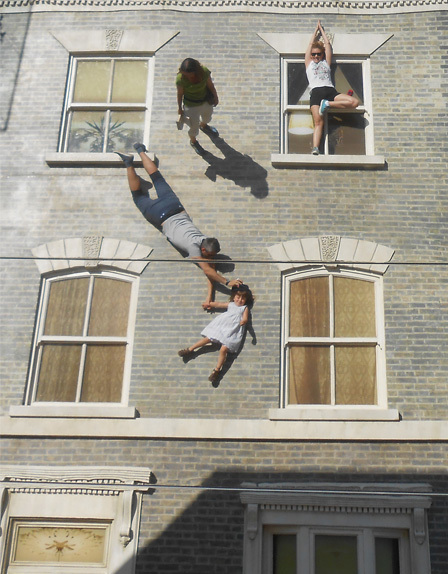 Internationally known for his captivating, three-dimensional visual illusions, Argentine artist Leandro Erlich has been commissioned by the Barbican to create a new installation in Dalston. 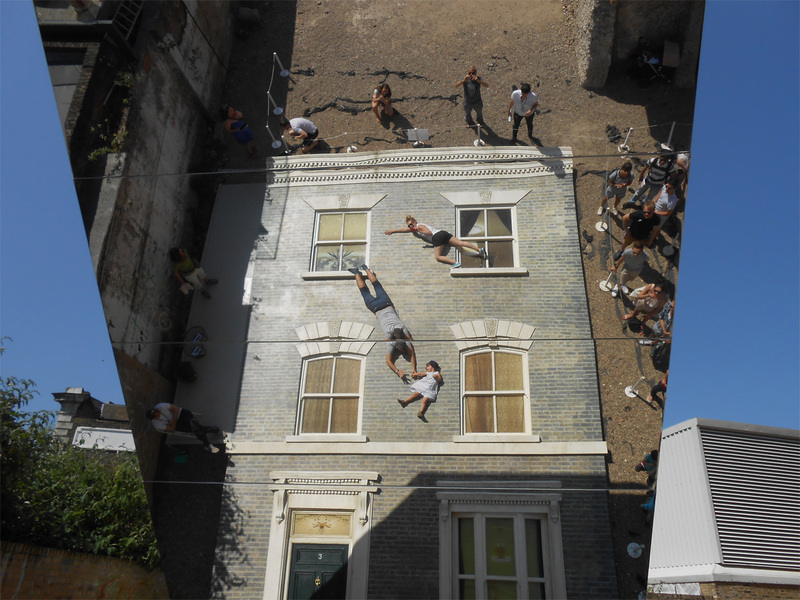 Resembling a theatre set, the detailed facade of a Victorian terraced house – recalling those that once stood on the street – lies horizontally on the ground with mirrors positioned overhead. 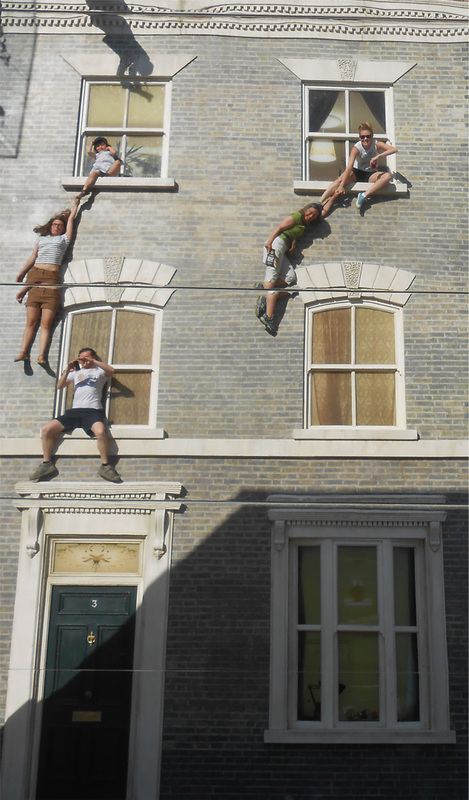 The reflections of visitors give the impression they are standing on, suspended from, or scaling the building vertically. Sited on a vacant lot on Ashwin Street, Erlich will design and decorate the façade to resemble the houses that previously stood on the block. 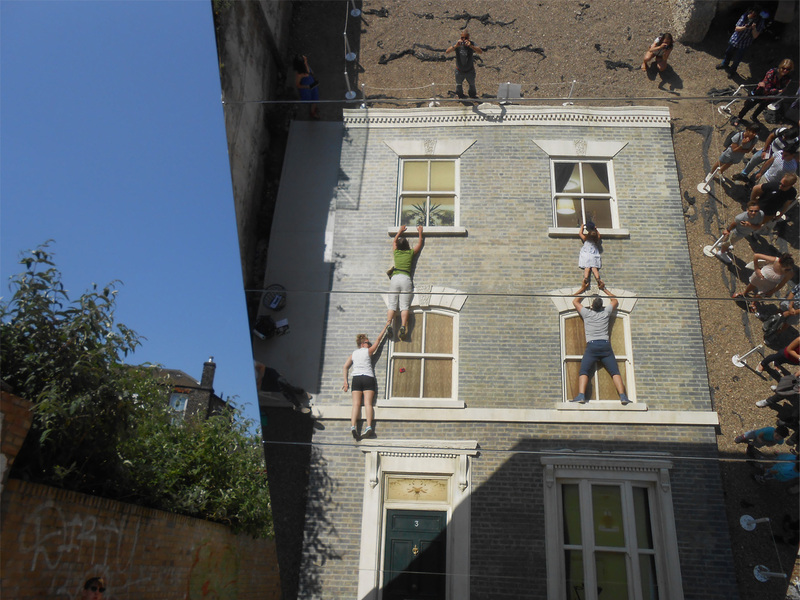 Erlich’s installation will be accompanied by talks, workshops and live performances, exploring themes related to the project, including architectural history, urbanism, and perception, which will be developed in collaboration with local organisations. 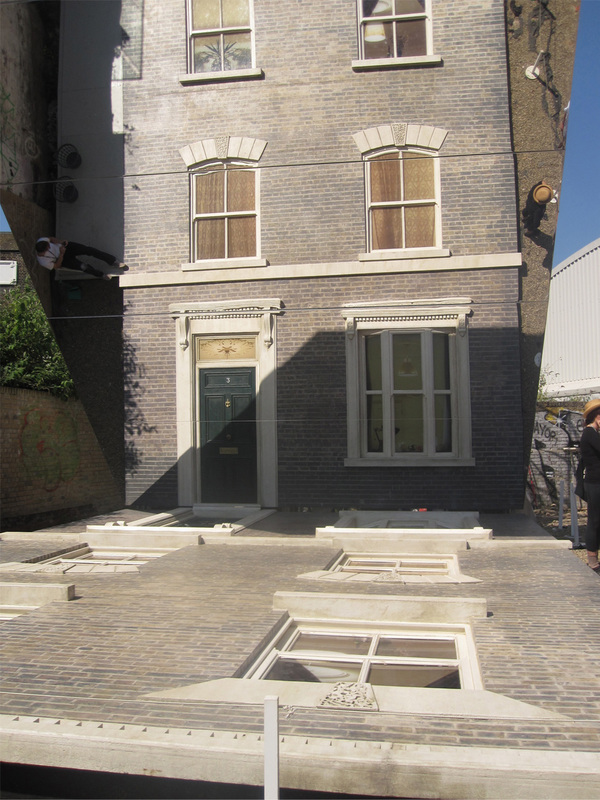 Travel to a very non descript lot in Dalston, just across the street from Dalston Junction, and the ‘House’ awaits. The basic framework of the piece is a very typical looking British house front lying flat on the ground with a large mirror angled from the bottom of the house. 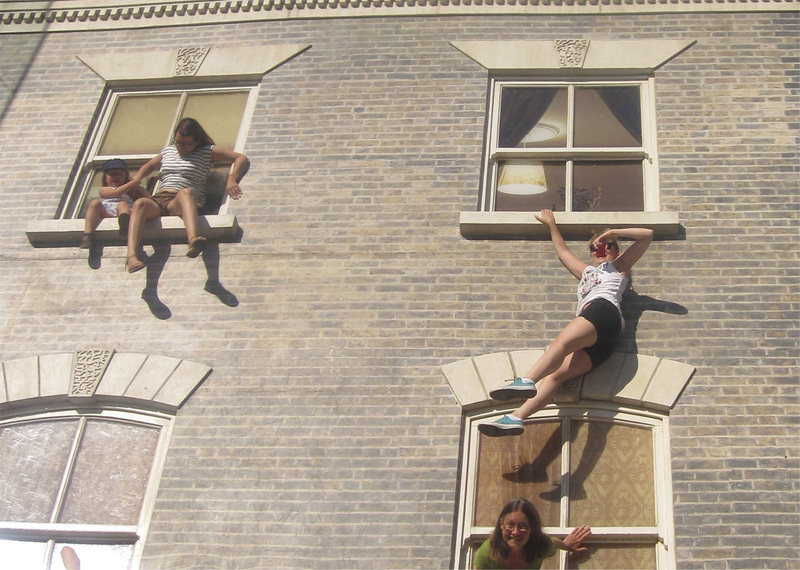 It’s a thoroughly interactive piece, and visitors have 5 minutes to clamber (mostly) all over the ‘house’ and take as many hilarious photos of themselves hanging off of window sills, perched on moldings, and dangling their kids down the sides of the building. Erlich has created a piece that lays flat and refuses to move, but demands interaction and excitement. Every person who poses it on does so slightly differently and adds to the dynamic and personality of the house. 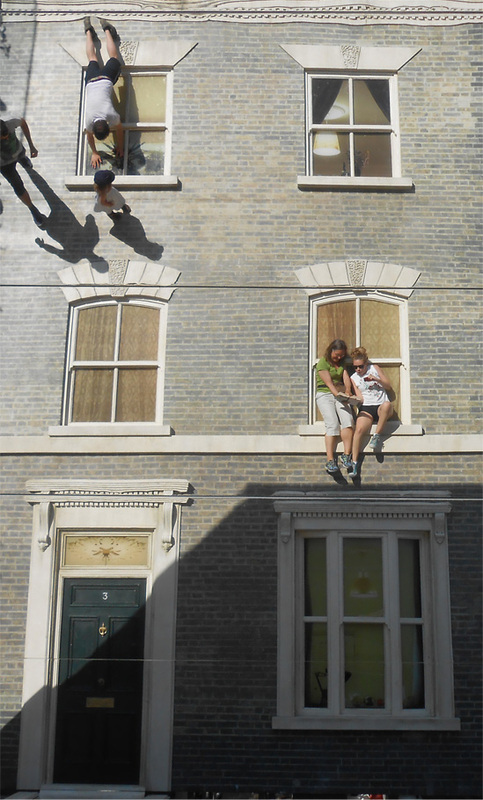 The façade of the house also adds an element of the temporary to the experience- you get 5 minutes and then it ends, it’s not a permanent installation- but yet the visual we climb over is designed to look like houses that once stood- permanently you’d have thought- on the site of this temporary faux-house. The piece seems to appeal to people of all ages. A man in his 80s went before us and was hilarious to see hanging off of the ledges, and in the group I went on with there was a very young child taking some hilarious and memorable snaps with her parents. There is, of course, a queue, but watching the people go before you is a great part of the fun, and I would almost argue that whilst in the queue you are still participating in the piece. After the first round of people in front of us went, myself and another woman felt an overwhelming urge to clap, something we discussed in giggles (and we eventually clapped.) Its also great to watch the people in front of you posing, so that you know what to do when you get your turn. I’d recommend going with a bit of a group, and taking turns taking each other’s pictures. You can take your own pictures while you’re on the house, but they will come out better from the viewing area. Bring props, don’t wear a skirt (you will literally flash the entire neighborhood), and enjoy yourself! The exhibition is on until 4th August, and I would highly recommend getting there as close to opening time as you can. The queues are moving quickly now, but once word gets out about how much fun this is, expect a mad dash. 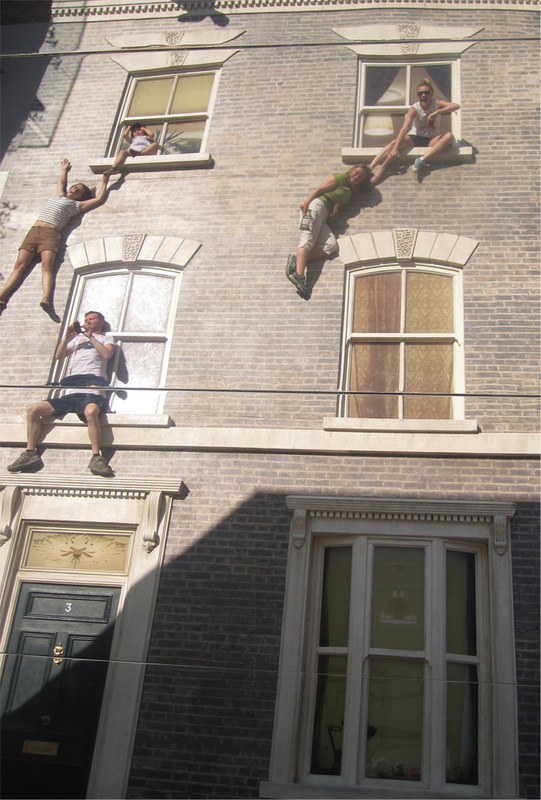 This entry was posted in Museum, Photos and tagged Dalston, Erlich, Exhibition. Bookmark the permalink.